A chorus of chainsaws filled the maintenance yard of Ty-Histanis on the spring morning of March 18. With the sawdust flying around them in the cool air, a group of teenage boys diligently work over a small log cabin, marking where the joints should fit with carpentry pencils. The boys are from three chapters of the Warrior program, an initiative designed to foster leadership in young First Nations men. The lads cut through the logs under the direction of Edwin “Buckshot” Bikadi, a seasoned log cabin builder who travelled from his home with the Lil’wat Nation in B.C.’s interior to teach chainsaw operating. On the seventh consecutive day of chainsaw training, 17-year-old James Walton admits the task isn’t always enjoyable. With over three Nuu-chah-nulth nations regularly engaging over 40 young men in Warrior programs, the initiative has grown over the last four years since it began as the Hitacu Warriors with the Yuułuʔiłʔatḥ First Nation. At times in its early days participation was sparse, recalls Walton, who continued to attend with the program’s guide, Ricardo Manmohan. “Me and Evan Touchie, for about a year and a half there we were just going out with Ricardo by ourselves,” he said. In recent years the teenager has gained regular exposure to outdoor survival skills, like fire-building, fishing and archery. This summer the Warrior program plans to build four cabins in Nuu-chah-nulth territory as part of a partnership with North Island College at locations in Effingham Inlet, the mouth of the Megin River, Nitinaht Lake and Indian Island near Tofino. Participants can earn high school credits through the leadership training. In September 2018 two chapters were added to the Yuułuʔiłʔatḥ Warriors with programs for Ahousaht and Tla-o-qui-aht youth. In Ahousaht the group meets one evening a week, plus a weekend each month of camping at a remote location, including during winter. 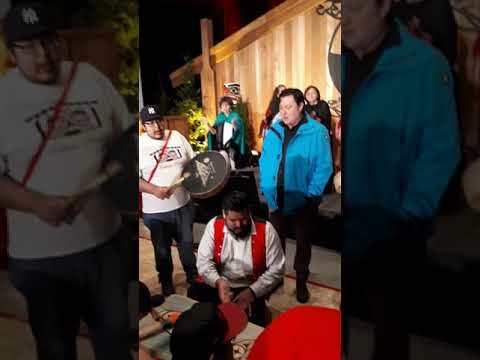 Thomas Paul, one of the program’s organizers, said the Ahousaht Warrior chapter was started to break the cyclical effect of colonisation that has damaged families’ traditional values. Paul noted the importance of looking back at the resilience of Nuu-chah-nulth peoples when they lived without the conveniences and distractions of modern life. The Warriors begin their cabin building projects in late June with a structure planned for the Megin River, located north of Flores Island on Vancouver Island. To provide shelter in remote locations for elders and youth, this activity is scheduled to continue into October with the project on Indian Island in Tla-o-qui-aht territory. Hayden Seitcher operates a chainsaw while building a small log cabin. James Walton has participated in the Warrior program since its early days four years ago. Copyright 2017 Ha-Shilth-Sa. All Rights Reserved.